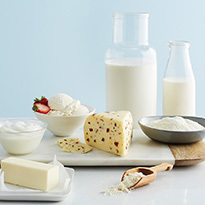 With a year-round milk supply, the United States is well-positioned to meet global demand for many other dairy products such as dairy blends, dairy calcium and infant formula. From East Coast to West Coast, U.S. suppliers are focused on customer needs and are ready and eager to partner with them all around the world. Search for a supplier by selecting the products and associated attributes below. We encourage first-time users of this directory to peruse the How to Search instructions as well as the Common Questions before initiating a search.